Panchayati Raj Department of Rajasthan. Third Grade Teacher Recruitment exam 2013 result has been declared on 30 December, 2014. The result will be uploaded by the Zila parishads on 31 December 2014. This exam was held in September, 2013. The result is declared for all the candidates who appeared in the exam, But the merit list will be declared for those candidates only who have secured at least 60 % marks in the RTET exam 2011 or 2012. Till 10 January merit list for all the subjects will be declared. Candidates with 60 % or more marks in RTET, who stands in the merit will be called for documents verification and will be issued appointment letter after the end of model code of conduct of Panchayati raj election 2015. This is expected up to 15 February, 2015. Candidates who have below 60 % marks in RTET, there result will be declared after the decision of Supreme Court Case. The result of merit list may be seen at the notice board of the concerning Zila Parishad or District website (web site name of districts are as Ajmer.nic.in or Jaipur.nic.in or Alwar.nic.in or Barmer.nic.in etc). It may also be published at the exam website which is http://tgtdreonline.in/tgtdre2013/ . 1. For Primary Schools- BSTC & RTET Level - 1 Passed. 2. For Upper Primary or Middle Schools- B. Ed. & RTET Level- II Passed. How to Apply- Apply Online at http://examtgt.rajasthan.gov.in/. Procedure- There will be Separate Advt for each district. The Jila Parishad will be publish the advt and organise separate exam for concerning district. There will be only objective Written exam. There will be no Interview. Separate Merit List will be prepared for each district. The Govt of Raj has given the Green Signal to issue appointment of Third Grade Teacher Level- I in Jila Parishads of Rajasthan. It is decided to issue appointment order up to 12 November, 2012. Although a case is pending in the High court regarding 55 % in RTET. So the Govt decided to appoint those candidate who stands in merit and have 55 % or above marks in RTET 2011. To see the appointment orders contact concerning Jila Parishad office. 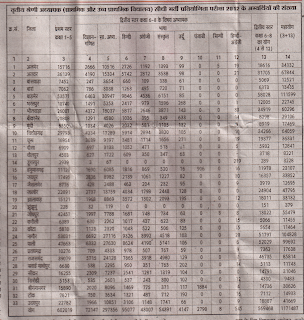 UPDATE 24.08.12 Rajasthan Third Grade Teacher Second Level Result is excepted to be declared on 24 August, 2012. After preparing the Result the Rajasthan panchayati raj and rural development department has called the CEOs of Jila Parishads on 23.08.12 to hand over the result. After analysis and checking the result it may be declared on friday. Detail will also be published at here after result declaration. Click the Total Posts for Detail Advertisement. Honourable High Court Of Rajasthan has vacated or Withdrawn Stay order towards Appointment of Third Grade Teacher Level I Appointments. The result was declared on 26.06.12 but High court passed stay order towards appointment orders to newly selected candidates. The Objection of Petitioners was that the Reserve candidates secured marks below 60 % marks in RTET 2011 cannot be selected against General Category Because the eligibility cut off for RTET for General category was 60 %. The appointments will remain conditional with High Court Final Judgement. The Result of Third Grade Teacher Recruitment Exam level I has been declared on 26.06.12. The Exam was held on 02.06.12. The cut off marks are declared for the two times of posts advertised for documents verification. Eligible candidates are advised to fill up the detail applications form with all supportive documents and to present on 3 and 4 July, 2012 in the concerning Jila Parishad office with all original documents. The Result of Third Grade Teacher Recruitment Exam is going to be declared soon. Level II result may be declared at about 10 July, 2012. The exam was held on 02 June, 2012. To See the Result keep visiting this site. After all The Third Grade Teacher Exam Process completed on 02 June despite many hurdles. As expected earlier the attendance of candidates was very low. 265838 candidates out of 11.71 Lacs present in the exam. The Attendance was 30 to 60 % in various districts. It is more easy to be selected through this exam than the Previous third grade exam because RTET passed candidates are less than the B.Ed./ BSTC passed. District wise merit list may be a good news for average students who can not fight state level merit. BSTC candidates in level-I in much benefit. There is as low competition among them as 2:1 in some district. Level I Bstc - 187 Posts, 862 Appeared, 2014 Applied. 1. Science Maths- 432 Post, 1823 Appeared, 2527 Applied. 2. SS- 432 Posts, 5785 Appeared, 9501 Applied. 3. Hindi - 138 Posts, 1614 Appeared, 2513 Applied. 4. English - 48 Posts, 809 Appeared, 1163 Applied. 5. Sanskrit - 138 Posts, 907 Appeared, 1322 Applied. 6. Urdu - 16 Posts, 40 Appeared, 90 Applied. 7. Sindhi - 4 Posts, 1 Appeared, 3 Applied. 8. Hindi Eng - 6 Posts, 4 Appeared, 16 Applied. Detail information about other Districts will be provided here as soon as available. Please visit continue this site. Honourable High Court of Rajasthan Double Bench issued a Latest order on 25.05.12 that B. Ed. Degree holder who have passed the RTET Level - I are not eligible for Third Grade Teacher Level -I Post. Next hearing date this case will be in July. The Recruitment this Process will be conditional under the High Court final judgement in this case. Thus this is Green Signal to the Exam on 02 June. Now the Admission/ Admit cards available for Level-I and Level-II from 24/25. 05.12. Under the Decision of Honourable High Court Double Bench. Next Date of hearing is 25 May, 2012.
the exam on 02 June, 2012.
with all rajasthan Jila Parishad CEOs through Video conferencing. The department intends not to invite fresh Applications from the B. Ed. The Process of Online Application Form Submission for Third Grade Teacher is completed now. It is a common Question in most of applicants that how many forms submitted /filled districtwise . Total 11.93 Lacs Forms submitted in all over Rajasthan for all districts. Highest Number of form were received in Jaipur District which are 2.31 Lacs and Minimum number in Jaiselmer which are 2924 Forms. For Ajmer District total 35192 forms were submitted against 1491 Posts. 15000 forms were submitted by the residents of ajmer district and remaining approx. 20000 forms submitted by residents of other districts. All Data about form are available with RAJCOMP an agency of Rajasthan Government. Separate Number of application forms for Primary Education and Elementary Education is not sorted yet. As per Pre decided Schedule the exam will be conducted on 13.05.2012. Admission cards and other information regarding Third Grade Teacher exam will be provided by the RAJCOMP. where i can get appled form data. wait for some days. data will be sent after avialability by email or by sms. Please submit all of your email ID and Mobile nos. 3rd grade teacher exam. Date kya ha. jo list apne submit ki ha wo roughli ha ya actul ha plz send me. This is Actual list provided by reliable sources. Please tell me OBC female total application in 2nd level science math in Barmer, Pali, Nagour and Bhilwara district. pali me kitne logo ne scince-maths se exam diya hainn.